The moment that I truly fell in love with THON was through my finance committee freshman year. I applied to the committee, not knowing what a committee really was and was ecstatic when I received the phone call telling me I got the position. Following my freshman year, my best friend’s dad’s cancer relapsed. He was denied from all the experimental treatments as there was no more room for him in the program. On September 14th 2016, he passed away. My best friend was abroad in Paris, and she was not able to make it home in time to say goodbye. To this day, I still get very emotional every time I think about that. Not only the fact that my best friend has to walk down the aisle without her father someday, but also that she didn’t even get to say goodbye. The funeral was a week later, and I drove home to go and support her. Coincidentally, the funeral was on my birthday and as I was sitting in the church, I thought to myself how lucky I am that I’m healthy and that I got to live another year, to make it to another birthday. And I thought about all the men, women, and children that don’t get another birthday. I wondered, what makes me so special? Why do these amazing people get their lives cut short while I remain perfectly healthy? And I knew then that I wanted to do more. After that, I had the most amazing experiences in the THON community as the Family Relations Chair of my organization, Schreyer Student Council, a Communications Committee Member, a Primary THON Chair, and a Communications Captain. I cannot describe THON 2018 in words; nothing I could say would truly do it justice. It was the most magical weekend of my entire life. But the next morning, I woke up to find out that a girl from my high school had passed away after a long battle with multiple types of cancer. An upsetting reality hit me: cancer does not stop. I truly believe that one day we will dance in celebration and that cancer cannot dull our inspiration, stop love, or hinder our laughter & smiles. But, there is still so much more to be done, kids to make smile, and people to save. I wanted to be a Director so that I could continue to do more until that day where we are dancing in celebration of a cure. What are your main duties as the Communications Director for THON 2019? Communications has 3 facets: Organizations, Education, and Outreach. As the Communications Director, I lead a captain committee of 21 captains who in turn lead 105 committee members and are the liaisons to all of the Penn State student body. As the Communications Director, I bring the organization perspective to every meeting, to ensure that we are making decisions with one of our most important stakeholders in mind: our volunteers. 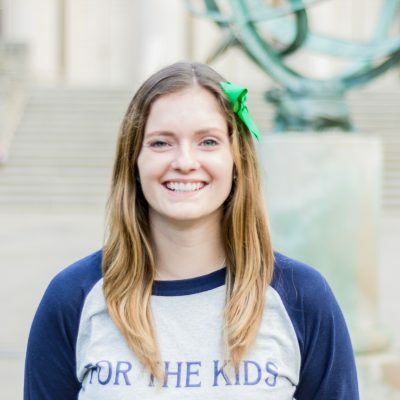 I help to spearhead THON's recruitment efforts to ensure that all students at Penn State are aware of the opportunities to get involved in THON. I also help to ensure all of our student stakeholders are properly informed of THON's history to be better ambassadors of THON's brand. Other responsibilities include the THON Blood Drive, overseeing the THON Office, and Captain and Director sleep-shifts THON Weekend. My favorite THON memory happened this past October. My organization went up to visit our paired Four Diamond’s family, the Tyler Miller family, for Halloween and the PSU-OSU football game. There was barbecuing, nerf gun fights, playing catch, and pumpkin carving before the football game began. For the game, the Millers brought their TV outside because it was such a beautiful night, and we all watched the game together. For each touchdown Penn State scored, we would throw around a bottle of whipped cream and squirt it into our mouths while Tyler's grandfather recorded it all on Facebook live. Even though Penn State lost the football game, we all had such an amazing time together. It was such a pure, carefree evening where everyone was just enjoying being there together in the moment. I will never forget that game! I am involved with Schreyer Student Council. I applied to be the Family Relations Chair my sophomore year and somehow was awarded the position! I had the most incredible year really getting to know the Tyler Miller family and I can honestly say they have changed my life for the better. Tyler is an inspiration to us all, and their family has always been so incredibly kind, generous, and welcoming to our organization members. Tyler will be starting his senior year of high school in the fall! THON is my absolute favorite part about Penn State, and I hope to be involved in some way, shape, or form for the rest of my life. THON Weekend is by far the best weekend of every year in my opinion. Seeing all of the kids faces' light up throughout the weekend as they're transported to a whole new world where they can be whoever they want to be and do whatever they want to do is life changing.